Many experts do not like the name flow battery. Rather they treat the device as a member of the fuel cell family. Indeed, the British Patent Office lists the device under fuel cell category. That is because unlike the conventional batteries the reactants (electrolytes) are stored outside the reaction cell of the “battery”. In the most common implementation the reactants are made to flow through adjacent chambers (half-cells) in the reaction cell. (That is the reason why these devices are called “flow batteries”). In the most common configuration, each half-cell has an electrode but there are no reaction plates (as in the normal lead acid battery). Direct contact between the reactants is not allowed and ion exchange takes place between the two, normally, through a very fine porous membrane which allows only the specific ions but no liquid. However, we will continue to call this device a battery in deference to the current trade practice. When an oxygen ion attaches to another substance, we say the substance has been oxidized. Formation of water from hydrogen is by oxidation of hydrogen. Reduction is the chemical opposite of oxidation, ie, removal of oxygen. A common trick in metallurgy is to obtain pure metal by reducing the oxide. Hydrogen combines with the removed oxygen to form water. The following types of flow batteries have been evolved. 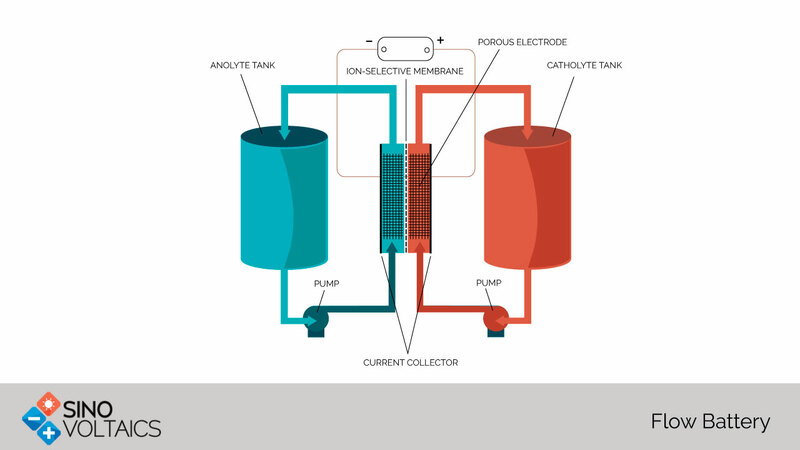 Membrane Type– This is the original type of flow batteries. Liquid reactants are stored in two separate tanks external to the reaction cell. The reaction cell has two half cells separated by a fine membrane which stops the liquids from mixing but allows the desired ions to cross over thus permitting a current flow. Positive and negative ions are collected at the electrodes and the potential difference so caused causes a current flow in the external circuit. The power rating depends on the area of the membrane and the total capacity on the size of the external tanks. Membrane-less Flow Batteries– The membrane may often a costly and problematic element. Membrane-less flow batteries exclude the membrane by using a simultaneous but laminar flow of the two electrolytes through the same channel over respective electrodes. Very little mixing of the electrolytes occurs. The patented Primus Power membrane-less redox flow battery is an example. Hybrid Flow batteries– An example is the zinc-bromine battery. Electrolytes are made to flow past carbon composite electrodes in two adjacent compartments which are separated by a fine polyolefin membrane. Anode side electrolyte is water-based. During charge, metallic zinc gets deposited on the anode in a reduction reaction. Bromide ions are oxidized to Bromine gas shedding electrons to the cathode. The electrolyte in the cathode half is added with an amine compound to help hold the bromine. Reverse actions take place on discharge with zinc layer on the anode getting depleted. Thus, the amount of zinc on the anode limits the capacity of the battery. A major advantage of the flow battery is ability to deep discharge-. These can be 100% discharged and then recharged. This compares very favorably with the 60% limit for lead acid batteries. Flow batteries can be almost instantly recharged. Just replace the electrolyte and recover the spent material. Flow batteries can tolerate extreme temperature conditions, on the hot side going up to 50°C. The zinc-bromine electrolyte used in the popular Zn Br flow batteries is a naturally fire retardant. There is no chance of an explosion due to thermal runaway. Heat extraction is helped by the flow of the electrolytes. Refurbishing flow batteries is cheaper because of a simple modular construction. As an example, a ‘dead’ battery could be restored by merely changing the electrode. Flow batteries have a have a lifespan of about 4000 cycles at 100% depth-of-discharge. However, lithium-ion batteries used at 80% discharge can offer a slightly better life span of 5000-6000 cycles. The charge recharge efficiency can be quite high depending on the type.